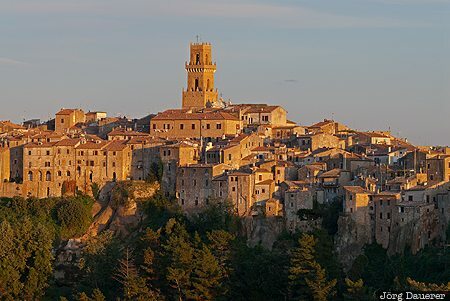 The skyline of the impressive tuffa city Pitigliano dominated by the tower of the Cathedral (La cattedrale dei Santi Pietro e Paolo) illuminated by warm evening light. Pitigliano is in the province Grosseto in the southern part of Tuscany, Italy. This photo was taken in the evening of a sunny day in October of 2009. This photo was taken with a digital camera.